An ankle sprain can be a debilitating and often difficult problem to overcome. In most cases, patients do not seek treatment immediately and/or the treatment offered is not up to par. I have spent a great deal of time at the local family practice and emergency room offices explaining how the treatment they offered their patients at the initial visits was not aggressive enough. Indeed, when initial treatment for ankle sprains is not aggressive enough, it may result in chronic instability and the need for surgery. Accordingly, let us take a closer look at the rationale behind the ankle sprain treatment protocol at our institution. To put it simply, an ankle sprain is a partial dislocation of the ankle joint. The most common form is an inversion injury with the foot rolling internally below the tibia, resulting in the talus pushing anterior to the tibia and tearing the lateral ankle ligaments. The less common and far less problematic sprain is the eversion sprain. The deltoid ligament is so strong that most eversion sprains result in either a minor problem or a fracture of the medial malleolus. Grading for sprains is simple. Grade 1 is a minor strain with no tear. Grade 2 is a partial tear. Grade 3 is a full tear. Often, the level of pain in a grade 3 full tear is less than a partial tear and results in the patient seeking less treatment. A more descriptive grading should include the level of instability and the potential number of ligaments torn. For example, a grade 2 sprain of both the anterior talofibular ligament (ATFL) and the calcaneofibular ligament (CFL) is far more problematic than a grade 3 tear of just the ATFL ligament. However, one must carefully consider the specifics of each case prior to selecting a treatment. The initial workup for an ankle sprain begins with obtaining a full history of the type of injury, the motion of the foot at the time of injury and the feeling after the injury. During the subsequent physical exam, palpate both the medial and lateral ankle, the base of the fifth metatarsal, the Lisfranc’s region and the medial, lateral and posterior tendons. Be sure to check the syndesmosis for stability and palpate the fibula along its course. In a day-old ankle sprain, the level of pain will often result in a difficult physical exam but the exam will still alert you to severe pain regions and anything truly out of the ordinary. Proceed to take radiographs of the ankle. When it comes to inversion sprains, I often will only take a medial oblique view of the foot with three ankle views. I will take full ankle and foot views with an eversion stress injury. Be sure to check radiographs for small fracture fragments, stress fractures, avulsion fractures, osteochondral lesions and joint instability or dislocation. In most cases, a sprain is a ligament injury and cannot be diagnosed with radiographs. However, radiographs can be helpful if there is a joint dislocation or gross instability. Furthermore, an osteochondral lesion that is visible on radiographs warrants surgery. In the case of dislocation or joint instability such as with a syndesmosis injury, surgery is required to stabilize the syndesmosis and realign the mortise. In most cases, radiographs are negative and it is far too early in the treatment protocol to consider expensive testing such as an MRI. In our institute, we have used diagnostic ultrasound for a soft tissue check of ankle sprains. The testing is relatively simple to perform and also inexpensive when compared to an MRI. One may check the ATFL, CFL and deltoid ligaments as well as the syndesmosis. Using diagnostic ultrasound, you can also check the peroneal tendons and posterior tibial tendon as well as the other structures about the foot and ankle. However, having diagnostic ultrasound as the only source of testing prior to surgery may leave you open to doubt. Therefore, if you suspect an injury that requires surgery, back up your opinion with an MRI or CT as needed. 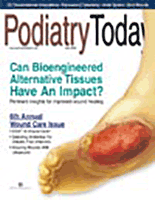 Treatment of an ankle sprain has evolved dramatically over the past 20 years. What used to require immediate surgery for ligament repair or casting for an extended period is now treated with minor bracing. At our institutes, we rarely use casting in our treatment protocol. Many studies have shown that the lack of motion during recovery from a sprain associated with casting results in scar formation and poor proprioception. The only casting we perform is in case of a fracture associated with a sprain. In these cases, the fracture would take precedence and would require casting. Otherwise, we place a severe grade 3 sprain in a protective long leg boot with crutches. The patient can place weight on the ankle as soon as tolerable. He or she may subsequently remove the boot several times per day and replace it with an Aircast brace to begin controlled motion. At this point, clinicians may start the patient on antiinflammation medication. As soon as tolerable for the patient, usually about one week, the patient can begin physical therapy to start controlled motion and gentle manipulation. Remove the boot at one to two weeks after the initial injury and continue the Aircast brace for a total of four weeks. At this point, one can move the patient to a functional lace-up brace. Have the patient begin proprioception and balance exercises at the two- to three-week mark. When it comes to Grade 2 sprains, you can utilize an Aircast with or without crutches. Start physical therapy within the first three to four days and instruct the patient to walk on the ankle as soon as he or she can tolerate it. Switch the Aircast with a functional brace at two weeks and have the patient begin physical therapy for balance and proprioception. If patients present with Grade 1 sprains, have them use a functional lace-up brace and watch them for any further problems. If a patient with a grade 1 sprain feels uncomfortable with balance, send him or her to physical therapy for balance and proprioception exercises. In all cases and especially as you go from stage 1 to 3, patients should use a functional brace for an extended period of three months with regular activity and six months with exercise in order to help prevent reinjury. A Grade 1 ankle sprain should resolve within one month. Grade 2 sprains should resolve within two months and Grade 3 sprains should resolve within six months. If patients have continued pain and no resolution of symptoms at three months, clinicians may want to consider further diagnostic testing such as an MRI. In most cases, an MRI will show a tear of an associated ligament, a possible peroneal tendon tear, scar tissue in the ankle and a possible osteochondral lesion. In all cases, it is important to correlate the MRI with the patient’s complaint. A medial talar osteochondral lesion will usually not be a source of pain laterally about the ligaments and may be from an old injury unrelated to this period of pain. If the MRI finds a torn ligament and the exam notes no laxity, it is not essential to repair the ligament. Keep in mind that it is rare to have instability with one torn ligament (i.e. ATFL or CFL). However, there is a good chance of instability if both ligaments are torn or one is torn and the other strained. If further information on instability is necessary, take stress radiographs with an anterior drawer and talar tilt testing on both feet for comparison studies. It is common to require surgery in 5 to 10 percent of ankle sprains treated with appropriate conservative care. The surgeries may include ligament repair, tendon repair or osteochondral lesion treatment. The timing of surgery should be at least three months post-sprain and may even be stretched out from six months to a year if not urgent. In the case of ankle instability, it is rare to require a secondary ligament repair and most cases heal well with a modified Brostrom ligament repair. When it comes to osteochondral lesions, one may employ arthroscopy and drilling unless lesions are very large and deep. In these cases, cartilage and bone grafting may be necessary. For most peroneal tendon tears, surgeons can repair these through primary repair or transfer to the contralateral tendon if they note severe damage. It is essential to treat ankle sprains aggressively. Since they are the most common sports injury presenting to emergency rooms and most emergency rooms do not see the patient again, practitioners often undertreat the issue. When these patients initially present, it is important to stabilize the ankle properly in order to allow for full healing and no laxity. Often, we are left to deal with a gross instability years down the road due to poor initial treatment. In cases of gross instability or chronic pain, clinicians can handle a majority of cases in a manner similar to the acute ankle sprain pain that has not resolved. Radiographs and an MRI can diagnose the problem and most cases resolve with excellent outcomes. Primary ligament repair is the most common required treatment and has an excellent outcome potential when clinicians combine this with physical therapy for proprioception and balance work. For osteochondral lesions, surgeons may opt for drilling or cartilage and bone transplant. It is also essential to repair tears to the peroneal tendons if associated with an ankle sprain. This can be done at the same time as the ligament repair. In the rare case of a missed syndesmosis injury, there may be the need for ligament repair and syndesmosis repair or fusion. I hope this article provides a platform for all readers to build their own office protocols. I believe that through the education of primary care physicians and emergency departments, you can increase the referrals to your practice for a simple but often neglected problem. Future columns will try to break down each part of the surgical treatments for more guidance and information. Dr. Baravarian is the Co-Director of the Foot and Ankle Institute of Santa Monica. He is an Associate Professor at UCLA Medical Center and is the Chief of Podiatric Surgery at Santa Monica/UCLA Medical Center. Dr. Baravarian may be reached at bbaravarian @mednet.ucla.edu.